Sprinting and running help develop agility, endurance and speed while contributing to cardiovascular health. Games that hone these skills make developing these abilities fun and entertaining. 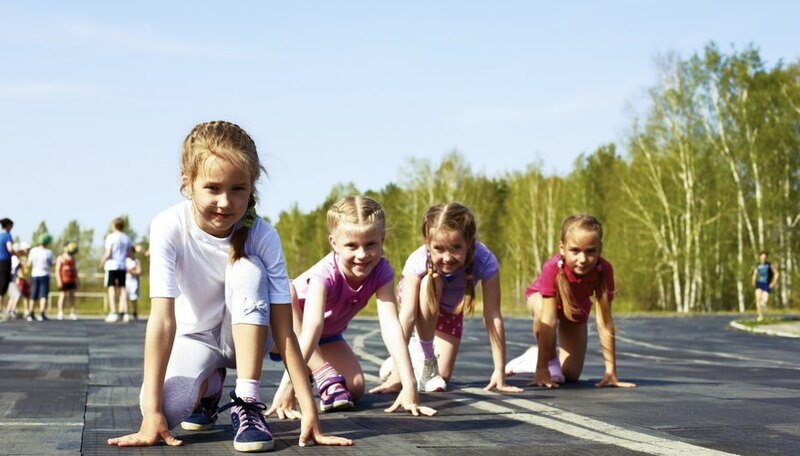 Playing sprinting and running games can help kids get their recommended 60 minutes of aerobic activity each day, and contribute to adults' recommended 75 minutes of vigorous activity each week. Capture the flag is played by two teams. Each team has a flag at its home base that it is trying to protect. The goal is to steal the other team's flag and get it back to your home base. You have to sprint to avoid getting tagged by the other team while trying to get to the flag as quickly as possible. If you get tagged, you go to the other team's jail at their home base and can only get out if one of your team members sets you free by tagging you. The first team to get the other team's flag back to its home base without getting tagged wins. Three-legged races are run in pairs, and you need at least two pairs for the race. Each pair has one of each partner's legs tied to together so that each partner has one leg free and one leg tied to their partner's leg. Mark a starting line and a finish line. Line up the pairs at the starting line. When the race begins, each pair must run as quickly as possible toward the finish line. The pair who gets there first wins. Red-light, green-light is a group sprinting game. One person is selected to be the traffic light and stands at one end of a field. The rest of the group stands at the other end. When the traffic light says "red light," everyone has to freeze. When he says "green light," everyone must sprint toward the traffic light as fast a possible, freezing again the next time "red light" is declared. The first person to get to the traffic light gets to be the traffic light next. Tag is another group game that requires both running and sprinting. One person is selected to be "it" and must chase all of the other players in an effort to tag them. In traditional tag, the player who gets tagged becomes "it." However, there are many variations. In freeze tag, each player who is tagged must freeze and can only move again if another player who is not "it" tags them. The game is over when all players are frozen. In shadow tag, players' shadows are tagged rather than their bodies.